Two of Bollywood’s biggest stars Ranveer Singh and Deepika Padukone have finally tied the knot after 6 years of courting each other. We are dying to see the pictures of the married couple or even know slightest detail about the celebrations taking place in Villa del Balvianello at Lake Como, Italy. The wedding took place in Konkani style on the 14th of November. The wedding festivities are taking place at the villa that sits right at the end of a peninsula and offers some stunning views of Lake Como. People have been keeping a sharp eye out for pictures that may be shared by careless guests on their social media accounts – the couple had reportedly banned guests from posting anything about their wedding. They have also been told to tape their camera lenses on their phones. Tight security measures included drone interceptors in the sky and guests being made to wear special wrist bands and scan unique QR codes on their phones to gain entry. Pictures have been hard to come by. The never-ending wait for Deepika and Ranveer’s wedding photos have been best summed up by Smriti Irani. Though we may not know much , we have got know some details from the mehendi and wedding ceremony that took place on the 13th and 14th November respectively. A source who attended the mehendi ceremony reveals, “Songs of Ranveer and Deepika like Laal Ishq, Lahu Muh Lag Gaya and more were played on the guitar during the mehendi ceremony. Ranveer and Deepika who were extremely happy, slow danced to these songs.” While we didn’t get a glimpse of the mehendi, we can surely picture this amazing couple dance to the tunes of their songs. Another source reveals that Ranveer went down on one knee asking Deepika to marry him and gave impassioned speech to his beloved. It was also revealed that Deepika was very emotional during the whole mehendi ceremony and teared up during Ranveer’s speech. Speaking about Ranveer’s and Deepika’s wedding, the couple have two wedding ceremonies, one the traditional Konkani wedding which was held yesterday. It is reported that around 30-40 close friends and relatives were invited for the wedding. The actors flew in 12 florist from Milan for their wedding ceremonies. Sticking to the white and gold theme,the dock as well as the pathway leading to the ceremony hall was covered in white roses. On November 15, the couple will remarry again in complete Sindhi tradition. The wedding will be held any minute today. The couple’s wedding attires were designed by none other than Sabyasachi Mukherjee. For their first wedding yesterday, Ranveer and Deepika chose Sabyasachi creations. Deepika looked resplendent in white and gold while Ranveer colour-coordinated his outfit with the bride. After their Konkani-style wedding yesterday, Ranveer and Deepika had a lavish luncheon in place for their guests. Navgrahi Puja: This puja is performed on the morning of the wedding. The priest offers prayers to various Gods and Godesses and also to all the nine planets. This is done to appease the stars and deities so that they remove all obstacles from the couple’s paths and the wedding progresses smoothly without any problems. Garo Dhaago: The priest performs a puja on the morning of the wedding to offer prayers to the ancestors of both sides. A red thread is tied around the wrists of both the bride and the groom during this puja. Baraat: The wedding procession starts from the groom’s place, complete with his friends and relatives. They approach the wedding venue, singing and dancing to music. Jaimala: Once the baraat reaches, it is welcomed by the bride’s family and proceeded to the stage or mandap. The bride and the groom finally meet and exchange garlands three times. Palli Pallo: The ends of the bride’s dupatta is tied to the groom’s. The groom’s siter puts two knots along with a few grains of rice. Hathialo: The right hands of the bride and the groom are tied together with a red scarf. The couple is then made to pray to God and wish for a happy married life. Kanyadaan: The bride’s father officially gives his daughter to the groom and requesting him to take care of his daughter for the rest of their lives. He seals the giving over by pouring holy water over the couple’s joined hands. Phere: A puja is performed by the priest in front of a sacred fire. The priest recites mantras and pours offering to the fire. He then asks the couple to stand up and take four rounds of the fire also called phere. The bride leads during the first three pheras while the groom leads the last one. While performing each round, the priest recites the couple’s wedding vows. The couple utters the sacred vows of marriage and promises to love, care and respect each other for the remainder of their mortal lives. Saptapadi: Seven piles of rice is placed in front of the couple. The bride has to step on each of these piles of rice while being helped by the groom. The rice piles represent future difficulties in the couple’s life and the seven steps together signify the beginning of their journey, while being each other’s ally throughout. It is reported that, the couple’s Sindhi wedding will see a red theme. The villa will be decorated with red flowers especially red roses today, keeping with the colour scheme it seems. Deepika is wearing a heavily embroidered red lehenga for the Sindhi wedding, while Ranveer will wear a Kanjeevaram sherwani by Sabyasachi. Deepika Padukone and her family will then host a reception party for their friends at The Leela in Bengaluru, on November 21. On November 28, Ranveer Singh and his family will throw a bash for their friends and Hindi film industry colleagues. The Mumbai reception will see all big Bollywood names in attendance. The couple has asked the guests at their Mumbai reception to not bring any wedding presents for them but become a part of a larger cause instead. They have asked them to make donations to Deepika’s non-profit organisation The Live Love Laugh Foundation, which aims to create awareness about mental illnesses and reduce the stigma surrounding them. It is reported that the couple with post their wedding pictures at 6pm IST. The wait is about the end. While the #DeepVeer wedding shenanigans are already underway, wedding wishes have already started to pour in for the couple. Karan Johar was among the first to wish the couple a beautiful married life. Though he wasn’t an invitee for the wedding. Deepika’s cousin Amit Padukone who attended the wedding took to twitter to wish the couple a happy married life. 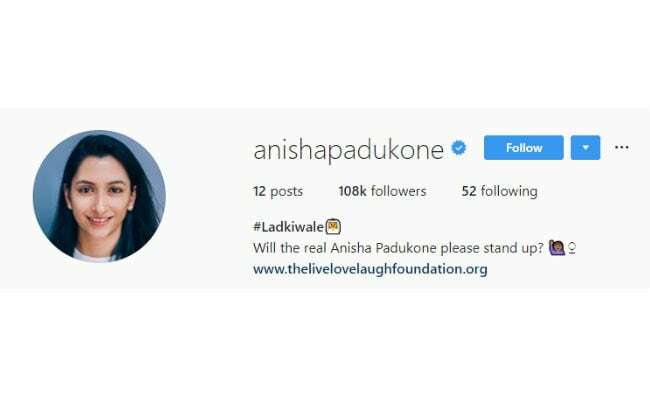 While sister Anisha Padukone who seems to be excited about her sister’s wedding has changed her name on Twitter and Instagram to ‘#Ladkiwale’. Amul also showered their blessings on the newly weds! Are these pics from inside Deepika Padukone, Ranveer Singh’s wedding Venue? Here’s wishing the bride and groom a happy married life! Also read: First Goan to make history on Kaun Banega Crorepati?